Many of us have multiple accounts on different social networks and generally, our contacts are not repeated in one or the other. For this reason, it is not redundant to publish the same information on Twitter and Facebook. There is a simple and quick to do, without resorting to complicated applications or the annoying cut-paste system. Publish our tweets on Facebook is something that make many applications; however, we do not always what we say on Twitter is read by our friends on Facebook. What we publish on social networks may generate many problems if the wrong person sees it. It is therefore important to have the right tools to avoid these bad times. One is Selective Tweets, a very simple application that allows post on Facebook only those tweets that we choose and is not all we write. What you should do is to add the hash at the end of the tweet #fb. A simple and fast way to synchronize our accounts, publishing in both only what we want. 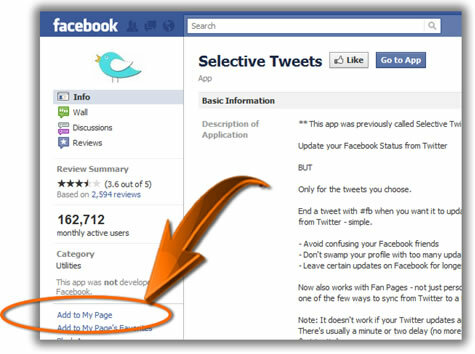 Join the official fan Page of Selective Tweets and click on the button: Go to the application. In the screen that appears, enter your Twitter user and click on Save. Ready! Now you just add #fb to your tweets so that they appear in Facebook. Note that in the case of link or image on the Facebook wall appears only URL and not the preview. Furthermore, Selective Tweets does not work if Twitter updates are protected.